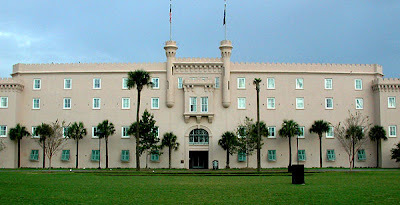 When we first got here we learned that Charleston is known as one of the most haunted places in America. Neat! I thought. But I never believed much in "ghost" stories. 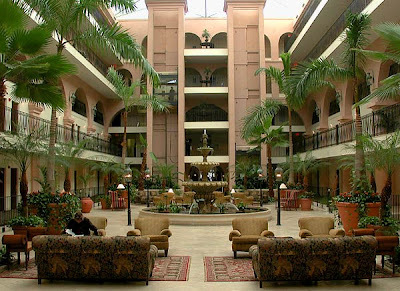 I went about my business and got a job at Embassy Suites, which turns out is the old Citadel. First built as an Arsenal in 1830 then later converted into a military college in 1842. It was citadel cadets who fired shots at a Union relief vessel approaching Fort Sumter... starting the Civil War. Well the hotel is haunted. There are places where some of the employees refuse to go, such as the weird “basement” under the catering staging area on the mezzanine. The staff told me how some guests end up switching rooms. Some leave in the middle of the night. One ghost is called "half head" or "the lost cadet.” He is young, has no head from the eyebrows up, and is often reported as a happy ghost. One lady woke with an eery feeling that someone was in the room, and she asked if anyone was there. The reply was, as stated by the lady, that his name was George. She then asked "George" what he wanted and he replied that he was looking for his pocket knife which he had lost. As she reached around to -touch -George, she found that his head "was not all there" as she stated later upon having her room changed to another part of the hotel. The hotel does have an old pocket knife on display. It was excavated from the hotel site along with many other artifacts of Civil War and Colonial origin. There are people who say they've seen men in full confederate uniforms walking around. These "ghosts" are mistaken for Civil war re-creators. I haven't seen any ghosts... yet. but I will be keeping my eyes open! You should carry that knife you had in your backpack on the airplane and when you see ol' Half Head George say Hey George! I got something for you! Then try and give it to him. Then laugh when it hits the floor. Bet he won't such a happy ghost then. That'll teach him for shooting at us Yankee's. If I was there I'd pull out my nine and bust a cap, oh wait his head is already half gone. Holy crap. The whole paranormal world really freaks me out. I dont even like that feeling you get when you think someone's watching you. I get that a lot. Either I have a stalker or there's just something else out there. Personally, I'd feel safer with having a stalker. Oh, and if some half-headed ghost was in bed with me, I would wigg the crap out, I'd be the one screaming & running down the hall at 2 am. I took a 'ghost' tour while I was in Charleston. There's a ton of places! One fairly tall building there has a top floor that no one goes because a man hung himself there. Supposedly people outside have looked up and have seen him hanging in front of the window. Last time I was there the bottom portion was occupied by offices, but top is completely off limits. Oh! And there's a huge old house that is famously haunted. You've probably heard of it, but I can't think of the name. Starts with a 'P'. They turned the bottom part into a small lunch-in place so the public has the possibility to 'experience' something. I ate there. Didn't see anything. Damn. I travel for work, and I never look up stories before I go somewhere, my mind runs wild and I just don't sleep easy. I got to the hotel around 11pm (having no idea that it was a historical hotel until I got there; it was booked by someone else), checked in and got to bed pretty quickly. In the middle of the night, I thought I felt some weight at the end of my bed, like someone sitting on it, kind of trapping my feet under it. I couldn't tell if I was awake or not but it felt very real. I was trying to tell myself "WAKE UP, you're dreaming and you're going to scare yourself", but I was stuck in that twilight state. I was certain I could hear the bedcovers on the next bed ruffling and moving, like someone opening them to get it, but I felt like I couldn't move to properly look. Then, I slammed my eyes shut and sat up and yelled, "GO AWAY!" and then I think I convinced myself that it was a dream and faded out again. The next morning, I told my friend who was also staying there, and said that I didn't know if it was real or not but I it happened again, I'd request to move rooms. We went out for a bit, and when we came back, my ceiling had fallen down from water damage, and I was moved. It didn't happen again. I heard later that the place was extremely haunted and so today I finally looked it up and found this. That's awesome! Thanks for sharing the story! !